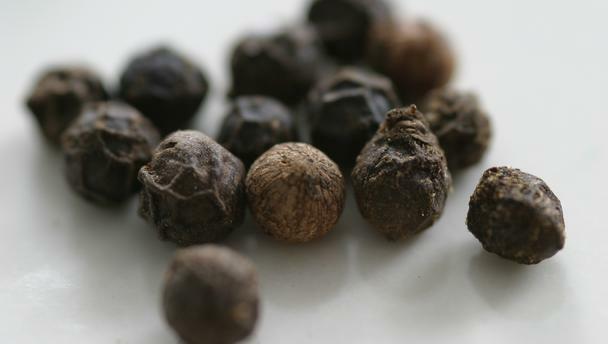 Other alkaloids found in black pepper: piperanine, piperettine, piperylin A, piperolein B, and pipericine . Typical dose used in supplements is 5 mg. However, in studies higher doses are used (between 20-50 mg daily). It has been shown that piperine can dramatically increase absorption of selenium, vitamin B, vitamin C, coenzyme Q10  and beta-carotene, . Piperine also increases the bioavailability of herbal and conventional drugs such as resveratrol and curcumin . Piperine favorably stimulates the digestive enzymes of pancreas which enhances the digestive capacity and significantly reduces the gastrointestinal food transit time. The results of clinical studies of piperine with drugs indicate that piperine administered orally at a single dose ranging from 20 to 50 mg may significantly increase serum drug levels by reducing the clearance of drugs, from natural or synthetic source. The mechanisms by which piperine increases the absorption may involve increased gastrointestinal blood supply , postulated thermogenic properties  and the increase in bioenergetic processes . Piperine can also attenuate free radicals and reactive oxygen species and has been shown to protect against oxidative damage in vitro. Piperin has been shown to inhibit both human drug-metabolizing enzymes P-glycoprotein and CYP3A4 (possibly others too) which may lead to grapefruit-like effect. Inhibition of these enzymes decreases their ability to break down drugs which in turn increases drug blood levels and which causes worse side effects etc. Therefore, black pepper should not be consumed in combination with any drugs. For example, it was shown that a single administration of 1 g of black pepper more than doubled area under the plasma concentration-time curve and elimination half-life of phenytoin . Piperine can be toxic for the central nervous and reproductive systems at high concentrations . Badmaev, Vladimir, Muhammed Majeed, and Edward P. Norkus. “Piperine, an alkaloid derived from black pepper increases serum response of beta-carotene during 14-days of oral beta-carotene supplementation.” Nutrition Research 19.3 (1999): 381-388. Srinivasan, K. “Black pepper and its pungent principle-piperine: a review of diverse physiological effects.” Critical reviews in food science and nutrition 47.8 (2007): 735-748. Annamalai, A. R., and R. Manavalan. “Effect of “Trikatu” and its individual components and piperine on gastrointestinal tracts.” Indian Drugs 27.12 (1990): 595-604. Kawada, Teruo, et al. “Some pungent principles of spices cause the adrenal medulla to secrete catecholamine in anesthetized rats.” Proceedings of the Society for Experimental Biology and Medicine. Society for Experimental Biology and Medicine (New York, NY). Vol. 188. No. 2. Royal Society of Medicine, 1988. Reanmongkol, Wantana, et al. “Effects of piperine on bioenergetic functions of isolated rat liver mitochondria.” Biochemical pharmacology 37.4 (1988): 753-757. Brewer, M. S. “Natural antioxidants: sources, compounds, mechanisms of action, and potential applications.” Comprehensive Reviews in Food Science and Food Safety 10.4 (2011): 221-247. Bhardwaj, Rajinder K., et al. “Piperine, a major constituent of black pepper, inhibits human P-glycoprotein and CYP3A4.” Journal of Pharmacology and Experimental Therapeutics 302.2 (2002): 645-650. Velpandian, T., et al. “Piperine in food: interference in the pharmacokinetics of phenytoin.” European journal of drug metabolism and pharmacokinetics 26.4 (2001): 241-247. Gorgani, Leila, et al. “Piperine—The Bioactive Compound of Black Pepper: From Isolation to Medicinal Formulations.” Comprehensive Reviews in Food Science and Food Safety 16.1 (2017): 124-140. Pachauri, Manendra, Enna Dogra Gupta, and Prahlad Chandra Ghosh. “Piperine loaded PEG-PLGA nanoparticles: Preparation, characterization and targeted delivery for adjuvant breast cancer chemotherapy.” Journal of Drug Delivery Science and Technology 29 (2015): 269-282. Mueller K, Hingst J. 2013. The athlete’s guide to sports supplements. Illinois, Ill.: Human Kinetics.